This is your Center. Together we are one voice for campus fire and life safety. On or Off-Campus - our mission is to help eliminate the loss of life and property. Join our members and we will improve campus fire safety together. Free Webinars ... Don't miss out. SAVE THE DATES - our 20th Forum will be in Atlanta. More info coming soon. Campus Fire Forum 2019, Atlanta, Georgia, Week of November 11 - this is our 20th Fire Forum. Campus Fire Forum 2020, Near Seton Hall area, 1st or 2nd week of November. This will be the 20th anniversary of the Seton Hall Fire and the resulting courage that triumphed over tragedy. Join us with our lifetime members, Shawn and Alvaro. Students living off-campus have always been the most difficult to reach. If you are involved in fire and life safety in student housing you know that we have made great strides in improving the on-campus, or campus owned residential buildings in the last 10 to 15 years. This improvement unfortunately took a great deal of tragedy and loss of life to get the necessary resources committed. There is still a great deal of work to be done. 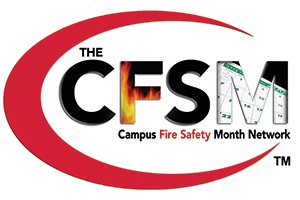 FireSmart Campus is a training program developed by a team of fire safety professionals and the The Center for Campus Fire Safety Board of Directors. It is an instructor led program targeting the campus fire safety educator who is accountable for Fire Safety at colleges and universities. This is typically a two-day program but can be reduced to one-day if required. A Coalition to Protect Students Studying Abroad ... Passport to Fire Safety is led by a coalition of organizations dedicated to protecting students abroad including the Center for Campus Fire Safety, the leading authority on campus re safety issues, and the Jasmine Jahanshahi Fire Safety Foundation, which was founded in memory of a student who died in 2011 while studying abroad in Paris. Become a member of The Center for Campus Fire Safety. Become involved in the sharing of information and networking that was envisioned when we moved to become a membership-driven organization. Our members receive discounts on our events, webinar and training sessions, as well as video, logo items and more. September is Campus Fire Safety Month and .... “it’s gone viral” said The Center's President Paul D. Martin. From Senators to legislators, governers, fire officials and universities, and other fire safety organizations ... “it is heartwarming to see such a concentrated effort.” Learn the history of campus fire safety month and see what schools across the nation are doing. The Center for Campus Fire Safety Student Committee is guided by Michael Swain, VP of The Center, and managed by The Executive Committee from The University of New Haven, Fire Science Club. The goal of this committee is to involve students from across the country in the mission to create awareness for fire safety in students - worldwide. So Many Tools and Resources ... Hundreds of everything .... Library articles and stories, Campus Fire incident Stories, resource tools, training tools, and much more. You'll also find our Fire Fatality Stats, Legislation updates and much more. This is the leading single source of campus fire safety resources. [ Visit the resource center. Sign up to receive Breaking News Alerts! You will automatically receive breaking news as it hits our home page. Stories will all be related to campus fire and life safety and include initial notification and information about fire fatalities that occurred on a university or college campus, or off-campus. Bring the After The Fire experience to your campus ... Alvaro and Shawn are Seton Hall burn survivors. We are pleased to have them as lifetime members of The Center for Campus Fire Safety. They tour the nation to speak! They discuss their ordeal of being college burn survivors at many colleges across the country. It’s good to see so many universities and towns helping to spread this message. Our Webinar Training Center is interactive! You will see the schedule of upcoming webinars and download handouts from previous webinars. Want to Present? To be considered, simply look for the "Webinar Presenter Link". And ... If you attended a webinar in the past you will be able to login to our Webinar Video Center and Download Center to view the actual webinar and download additional information.